In late 1946, after spending the years during World War II performing charitable works and raising money for the country’s war efforts, Babe became ill. While he had been prone to colds before and even had pneumonia in 1942, this illness was different. For much of the second half of the year, Babe had been suffering from severe pain over his left eye. In a November visit to French Hospital in Manhattan that year, doctors found the root cause of his pain — a malignant tumor in his neck. Even worse, the tumor surrounded his left carotid artery and Babe would need surgery to save his life. The surgery was successful to a limited degree. While the surgeons could remove most of the tumor, they could not get it all, forcing Babe to subsequently undergo radiation treatment. By the time Babe was released from the hospital in February 1947, he seemed to be doing a bit better. Although he resumed some of his favorite outdoor activities such as golf and hunting, it was also clear that Babe was still not fully recovered. He was pale. He had lost nearly 80 pounds from his prior year’s average weight. His voice was raspy due to the damage done to his larynx by the surgery to remove the tumor. Babe continued to take morphine for his constant pain and received an experimental cancer drug that seemed to help for a time. By the spring of 1948, however, it was clear that his poor health was getting the better of him. 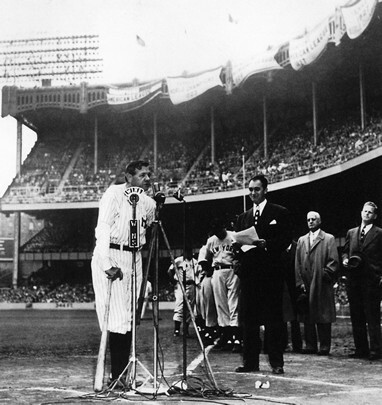 That was apparent when he attended the 25th Anniversary celebration of Yankee Stadium on June 13, 1948, where he posed for photos with his former 1923 teammates and spoke a few words to the crowd. The fans loudly expressed their love and appreciation for the Babe throughout the event. Shortly after this event, Babe returned to the hospital. The end was near. Yet, even from his hospital bed, Babe answered many of the hundreds of letters, with get well wishes and requests for autographs, that came pouring in. He even briefly left the hospital to attend the movie premiere of The Babe Ruth Story, although he couldn’t manage to stay through the entire film. Babe Ruth passed away on August 16th, 1948. In his will, he left 10% of his estate (after his wife, Claire, passed away), to be used, in Babe’s words, “in the interests of the kids of America.” His coffin lay in state at Yankee Stadium. Over the course of two days, over 200,000 people came to pay their respects and say their farewell to the Babe. 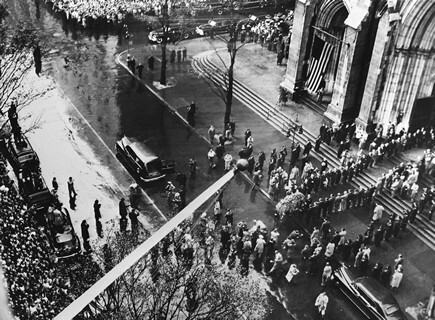 Hundreds of thousands lined the streets of New York to see his funeral procession. And, the Ruth family received hundreds of Western Union telegrams from organizations, notable individuals and Babe’s biggest fans across the country, all expressing their sorrow and acknowledging not only the family’s loss, but America’s loss as well. In a BRC exclusive, we invite you to view a sampling of these telegrams that the family received, selected from the Ruth Family archives.